The KS4 is a self-powered, high performance dipole subwoofer. At just over 37kg (80 lbs) and 16cm deep (6”), its ultra-compact aluminum enclosure has an incredible reserve of power. 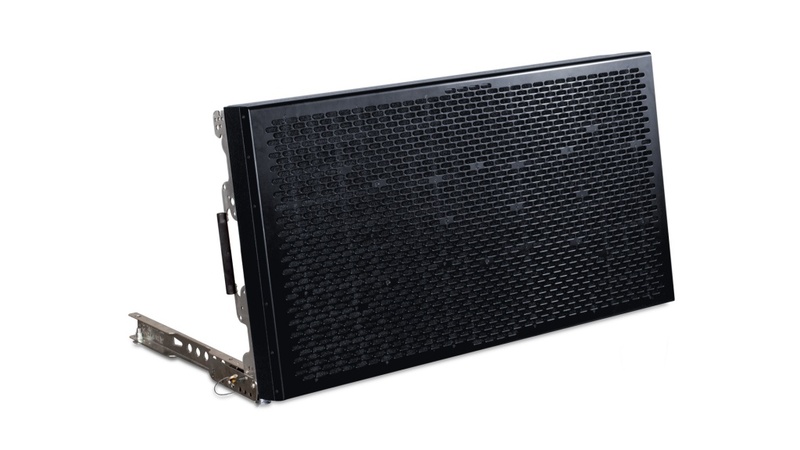 That ensures very high sound pressure with wide, consistent (120°) horizontal and vertical coverage. Its unique dipole ‘figure-8’ coverage pattern eliminates bass from coming off the side of the cabinets. This provides for a very controlled and quiet onstage sound, particularly in flown configurations. The KS4 is suited for medium to long throw applications in theaters, stadiums, houses of worship and concert halls. The KS4 integrated with the KH4 self –powered line array speaker, creates a high performance large scale solution. The KS4 uses eight, 10-inch high excursion cone drivers with 2” voice coils, powered by eight power amplifier channels. The woofers are mounted in a chassis that ensures high rigidity and resistance to vibrations. The integrated hardware system allows it to array with other KS4s to cover large open-air venues. An internal DSP module provides control presets. Dedicated remote control software allows for control of the speaker from a computer. All the KS4 components are designed by K-array R&D department and custom made under the K-array quality control system in Italy.